Johnson's France. Johnson's Holland and Belgium. 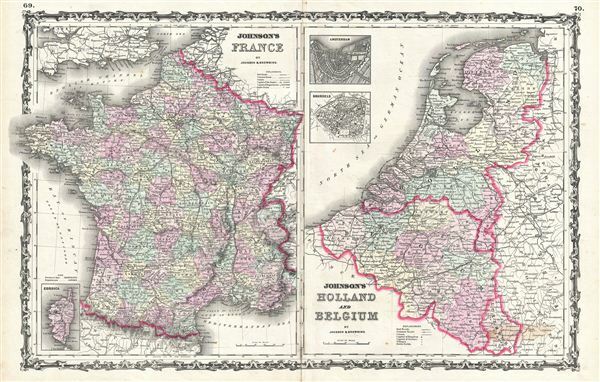 This is a beautiful example of A. J. Johnson and R. Browning's 1861 map of France, Holland (the Netherlands) and Belgium. The map is divided into two separate maps within the same border. The left hand map focuses on France subdivided according to its various departments. An inset map on the lower left corner details Corsica. The right hand map covers both Holland and Belgium from Friesland to Luxembourg. Inset city plans in the upper left quadrant detail Amsterdam and Brussels. In 1830, the Belgian Revolution led to the secession of Belgium from the United Kingdom of Netherlands and it's subsequently consolidation as the independent Kingdom of Belgium. Though Belgium had successfully attained self-rule, the Netherlands refused to recognize the new country until the 1839 Treaty of London. Very good. Minor toning and verso repair along original centerfold. Blank on verso. Minor overall toning and foxing.